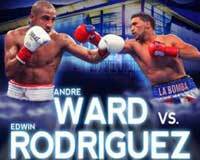 Review: 2013-11-16, fight not very ‘clean’ but pretty good: Andre Ward vs Edwin Rodriguez gets three stars. Both undefeated, the Dominican Edwin Rodriguez ranked as the No.4 super middleweight in the world, entered the fight with a record of 24-0-0 (16 knockouts) while Andre Ward had a record of 26-0-0 (14 knockouts – Ward is not ranked as he hasn’t fought since September 8, 2012 when he defeated Chad Dawson; currently the #1 in this weight division is Carl Froch). Ward vs Rodriguez is valid for the WBA Super World super middleweight title (title not on the line for Rodríguez because he failed to make the 168 lb weight limit). Watch the video!